A lot of people will tell you that love is a game that we all want to play and if that is true, it must be one of the most popular games in the world. 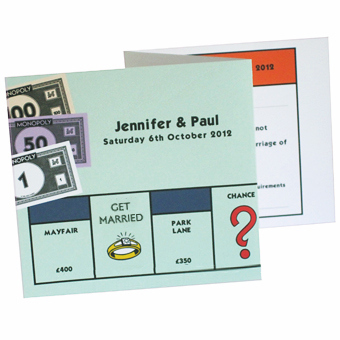 Then again, another very popular game is Monopoly and while you may not think of Monopoly as being something to connect with a wedding, the Monopoly Z Fold wedding invitation is the perfect wedding stationery for couples that love nothing more than moving past GO and collecting £200! As you would expect, the stationery is instantly recognisable and given that virtually everyone is aware of Monopoly, you’ll find that people instantly click with this classic style. The card is fully customisable which means that you can change the colours, the street names and even the icons to better reflect the happy occasion. There is plenty of space to provide information to all of your guests and the invitation comes with a perforated RSVP panel, making it easy for your guests to reply to your invitation. You don’t need to take a CHANCE in knowing who is going to attend your special day and if you want to cater for the whole COMMUNITY, you’ll find that this is the wedding invitation that appeals to guests of all ages and backgrounds. There is a full range of matching wedding stationery to accompany these wedding invitations from Bee Happy Designs, so if you are looking to make sure that your guests aren’t bored, given them invites, RSVP cards, name holders and many more items based on the classic board game.